But if there's one thing I DO know, that's using my slow cooker! I had to do my research on this one, let me tell ya, but the end results is a flavorful, slow cooked hearty soup that my husband and all of his co-workers raved about! Now, traditional Gumbo uses a roux to thicken up the liquid and has okra in it. Unfortunately, making it keto required 86-ing the roux, in favor of my favorite keto thickener: Xanthan Gum. I know, I know, that doesn't make it real Gumbo, but to eat healthfully, sometimes sacrifices must be made! 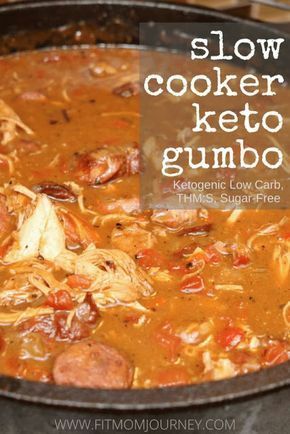 Gumbo is super easy to make Keto and in the slow cooker. You literally throw all the meats along with the veggies in the slow cooker, then add in the shrimp about 20 minutes before serving. Add all the ingredients except the shrimp in your slow cooker. Stir and mix well. Cook on high for 3-4 hours or low for 7-8 hours. Add the shrimp 20 minutes before serving. 0 Response to "KETO GUMBO (SLOW COOKER, THM:S, LOW CARB, PALEO, KETOGENIC, WHOLE30)"